The thick ceiling of clouds blocked the sun as the colors of the sky went from black to light gray. The westerly wind was 15 to 20 miles per hour with an occasional higher gust. The predictions were for these conditions to last throughout day; it was not going to get any better. Andiamo and Chesapeake left together with the anchors coming up cleanly and easily. 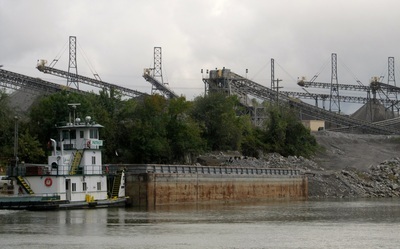 The Ohio River had tows backed up on each side of the nearby Summerville Dam. Andiamo briefly entered the river and turned up the Cumberland River for the 30-mile trip to the Barkley Lake Dam. 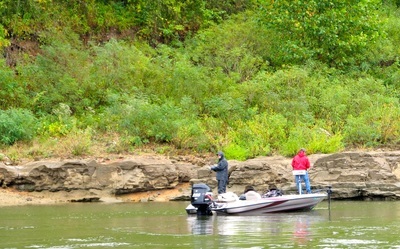 The Cumberland River was the narrowest river Andiamo had been on since the spring, being only about 100 yards wide. 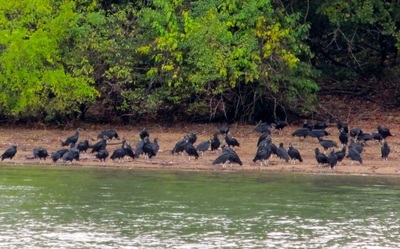 Forested on each side, with an occasional farm and a few large quarry operations, the cruise was easy and scenic as we watched an abundant amount of birds. 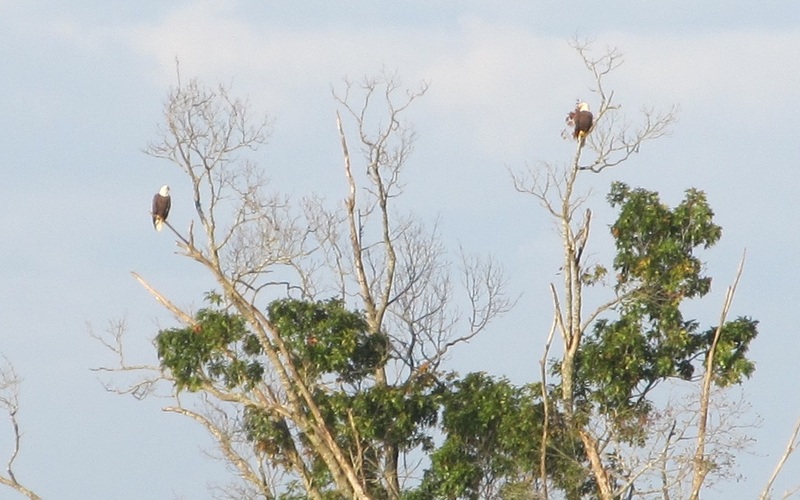 Eagles, hawks, herons, and kingfishers were feeding and hunting. The river protected Andiamo was protected from the wind. 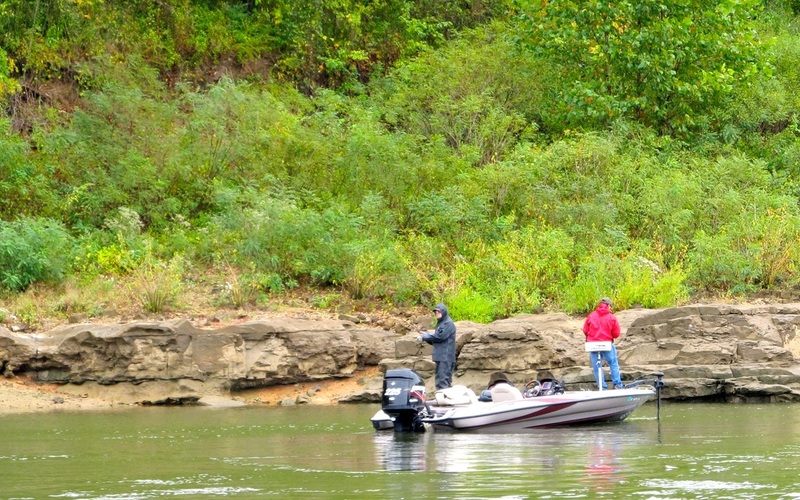 Barkley Dam was a fast 57-foot lift and Andiamo was in Barkley Lake. 20 minutes later, the tug had navigated the approach buoys to Green Turtle Bay, past the rows of covered moorage of big yachts and houseboats, and stopped at the fuel dock to pump-out. 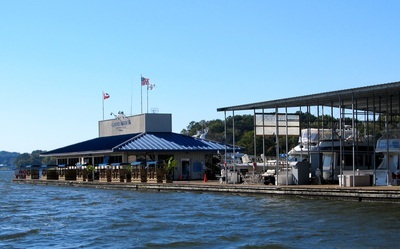 Andiamo had a half tank of fuel left; enough to pass on the high fuel prices here and get the lower prices at Pebble Isle Marina that were 70 miles down the lake. 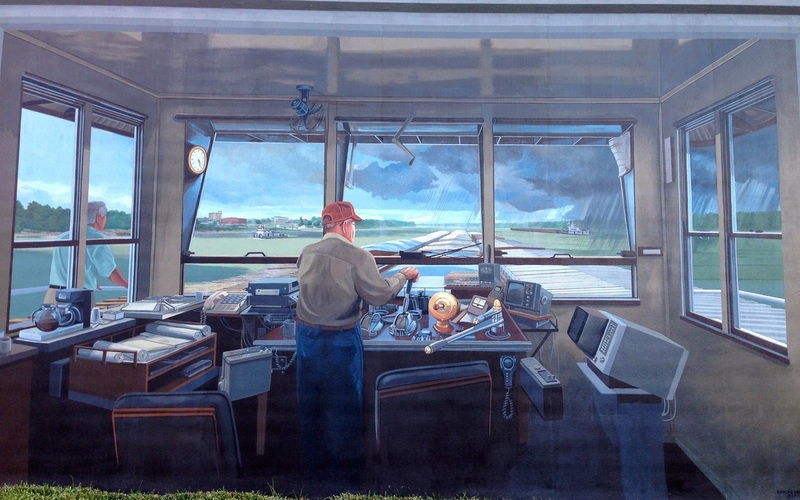 The concentration of looper boats that began at Grafton, Illinois continued to rise. There were about a dozen loopers here. But, we missed the mass exodus of a fleet of loopers who had left this morning for next week’s looper rendezvous that was being held 250 miles away. Andiamo was assigned a slip that was nearly the same one that the Laurie Ann, our Ranger 25, had six years ago. Now, Andiamo was going to retrace the only portions of the great loop that we had done in 2008. A package of new boater cards was waiting for us at the ship’s store. We walked and enjoyed getting off of the boat. Loopers came by and we had more conversations. For probably the last time, we had cocktails on Chesapeake and then had a great dinner at the nearby yacht club and thoroughly enjoyed Joe and Connie’s company. The morning was cold enough to require a heavier blanket and the diesel heater. 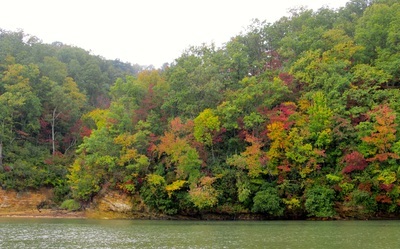 Fall was coming fast and the weather would push us southward. 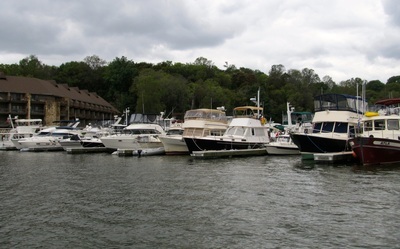 The marina’s expansive transient moorage was nearly empty with the flotilla of loopers having left the day before. We accepted Joe and Connie’s invitation for breakfast at a nearby grill. Coincidently, a couple they had met weeks before on the loop was there and we had a group breakfast and mostly listened to Monica’s tales. 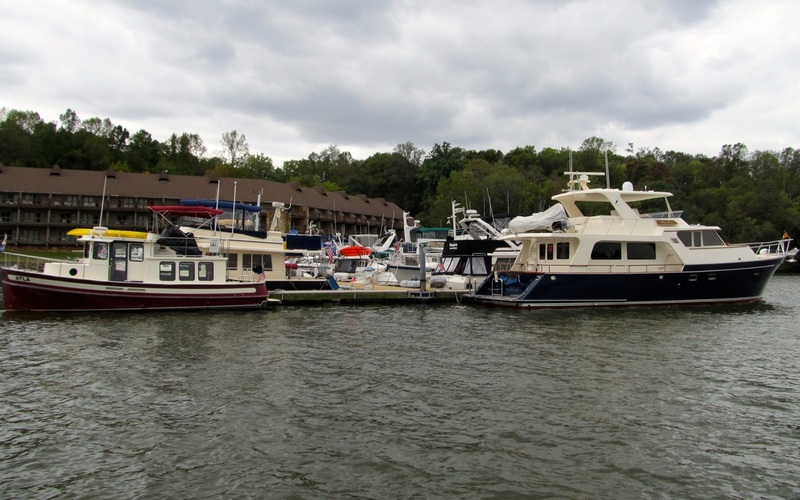 We helped Chesapeake pull away from the dock as they left for a marina to spend about a month. Pangs of farewell accented the morning. An Enterprise Rental Car had been arranged and we were picked up at noon with another looper couple that was renting a car. After getting the car, we did those necessary errands to re-set Andiamo for the next leg, food, alcohol and oil. Parts of Kentucky are dry counties, so more beer and wine was stored. The buying, driving, and storing took the remainder of the afternoon. After conversations with three more looper couples and a light dinner, going to the local theatre in Grand Rivers for a live performance that was delightful closed the evening. Sunday, we started the day by finding the St. Peter’s by the Lake, an Episcopal Church near Kentucky Lake. A small group but was energetic and genuinely friendly. The serendipity was having two other loopers came also and one pair was from Ballard, Washington. The priest said we were the most visitors they had had, except for weddings and funerals. We declined to have breakfast with the loopers only because we wanted to spend the afternoon exploring the Land Between The Lakes National Recreation Area that is known as LBL. 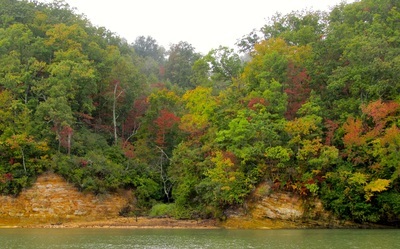 LBL is located between Kentucky Lake And Barkley Lakes on a ridge of limestone. 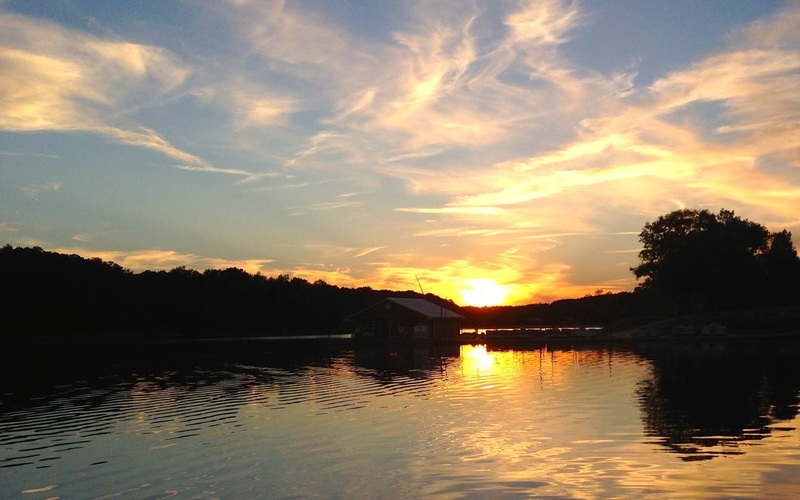 The recreation area was formed when the Kentucky Lake Dam and the Barkley Lake Dam were built in the 1950’s, flooding farmland and several small communities, and was administered by the Tennessee Valley Authority until the U.S. Forest Service took it over in the late 1990’s. The Nature Learning Center that is actually a zoo of native animals, the visitor center and the 1850’s Homestead was explored. For lunch, a café was found on the edge of LBL that had the best Brunswick Stew of the whole trip. 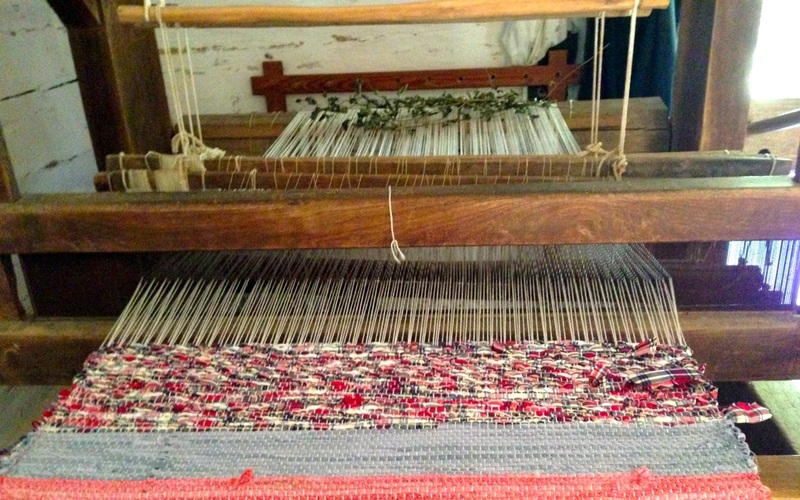 The owner makes her version only in the fall and was a hit. 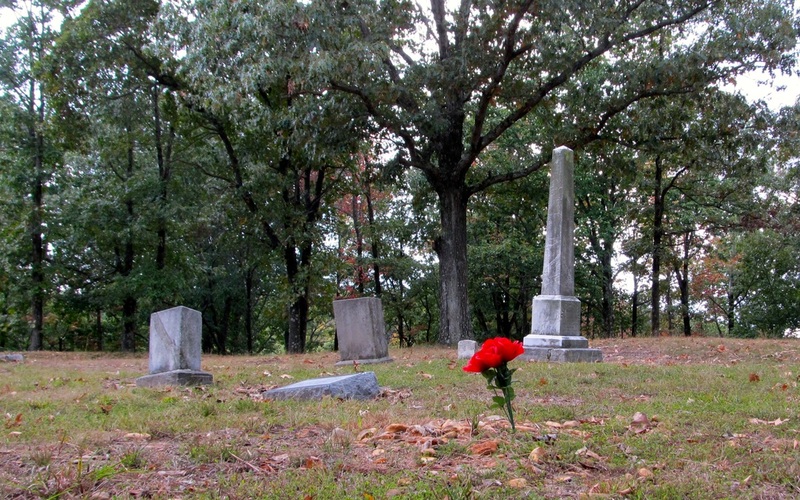 The take-a-ways: This limestone ridge was used to create iron and was the home of several hundred workers and their families; thus, the over 200 small cemeteries. Quickly, all the trees were logged to provide fuel for the smelting fires and the wildlife had been hunted-out. The environment was stripped and then abandoned. Today, the forest is thick and has rebounded. 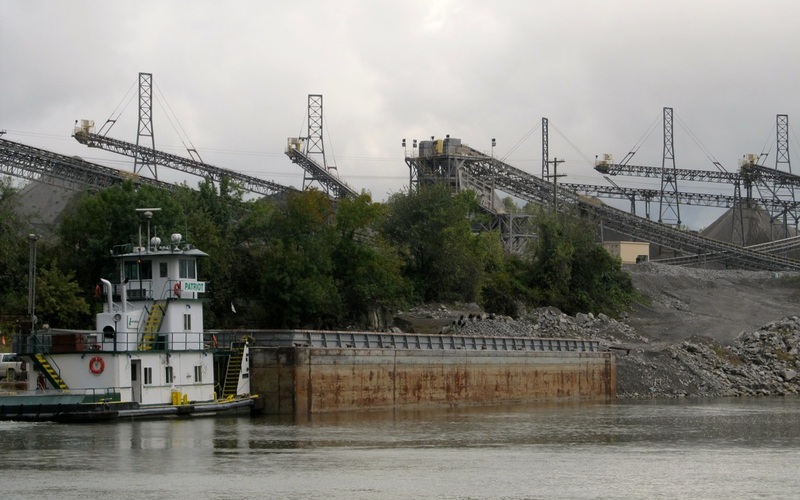 The anti-government sentiment is deeply rooted and going back into past generations with taking of land by the TVA being the most recent event. Monday morning was spent cleaning and polishing half of Andiamo’s hull. The river water had caused the hull to lose its luster. This could have been a travel day except the winds had kicked up the lake with gusts in the upper 20’s. 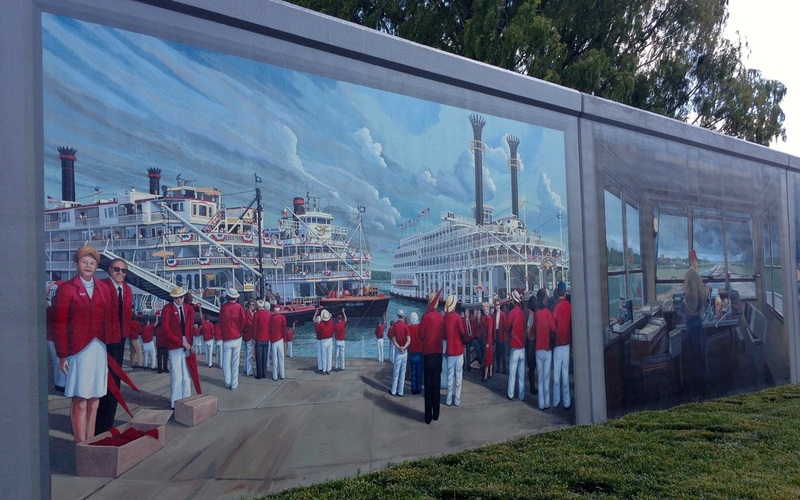 The afternoon was spent exploring Paducah’s historic downtown, the River Heritage Museum, and the surrounding area. Paducah goes from interesting to suburban dreary and broken in about four blocks. We got haircuts and bought a few items from the store. 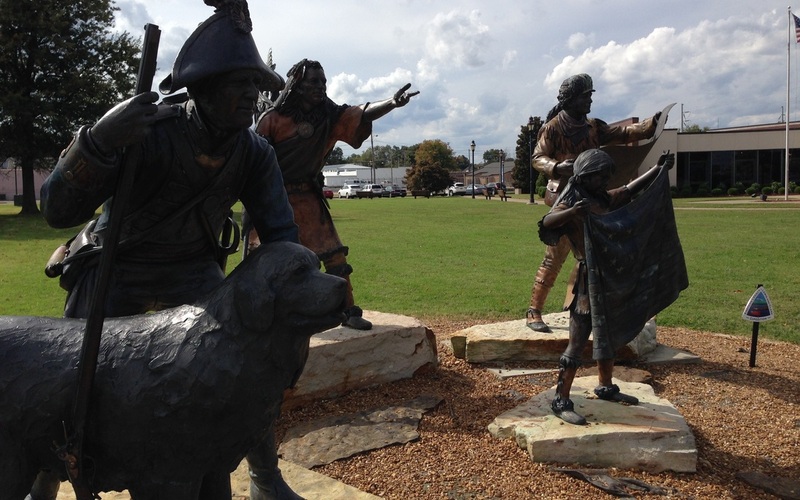 The take-a-ways: William Clark of Lewis and Clark fame, founded Paducah when it was part of his brother’s, George Rogers Clark, estate and he re-named it after the local Indian tribe. Clark’s relationship with the Native American’s was always a standout. Having spent a substantial part of my short career with the National Park Service explaining the Lewis and Clark Expedition to hundreds of 4th graders and visitors, I feel a familiarity with their story. Towboats typically have crews of 10 that work 30 days on and 30 days off. 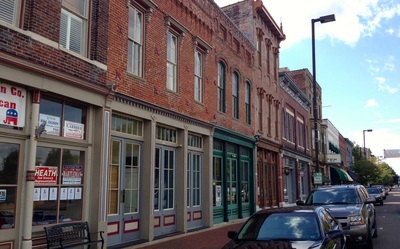 Paducah has tried very hard to not be another small town that is slowly dying and Kentucky is working the balance of a population that wants access to alcohol while paying attention to its deep roots in the Southern Baptist Church. Some alcohol is in the grocery stores but the stocks are nearly gone on Saturday because there are no sales on Sunday. Tuesday, the winds were again high and gusting, causing some loopers to stay another day and others to return back to the marina. I spent most of the day working on the portside hull that was severely water stained and was able to bring back the shine, sweating in the sunshine and doing 100 deep bends. Boat maintenance is akin to making amends for all the challenges we have put the tug through; it helps makes things right again in the universe. The rental car was returned, lots of electronic communication, and planning and research for the next leg of this adventure. In the four days here, we have probably had a dozen conversations with loopers and other boaters about the tug and the trip. Going to the yacht club for a very nice dinner closed the evening. 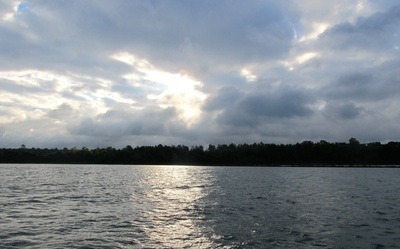 The sunrise at nearly 7 AM brought sunny skies, flat water and calm wind. We were restless to get back on the water and had the revelation that we really enjoyed the gypsy lifestyle, a pattern of movement, travel, and to see what is around the next bend. Four days in one place was probably our maximum. Green Turtle Bay was a detoxification for us, to purge our need for 11 to 13 MPH and to enjoy 7 to 8 MPH. Latitude-wise, we were roughly at the equivalent of being in San Francisco and the Gulf of Mexico was roughly the same as being in Ensenada, which is south of San Diego. 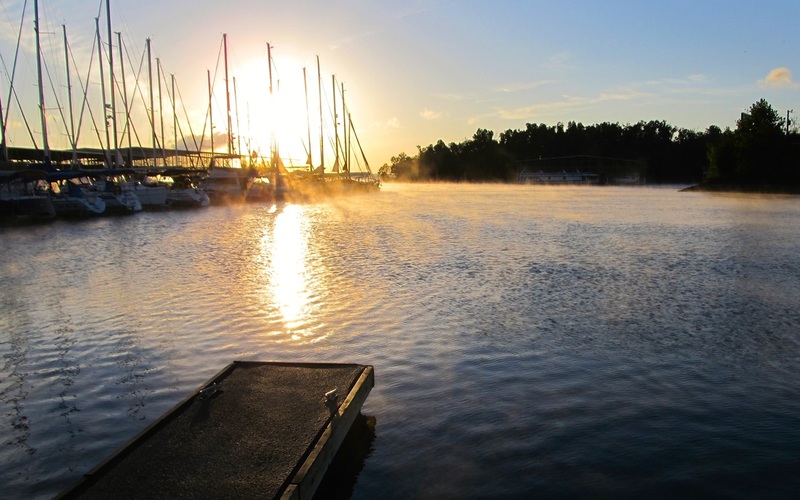 The destination was 43 miles away at Cypress Springs Marina were Joe and Connie was moored for an extended time. 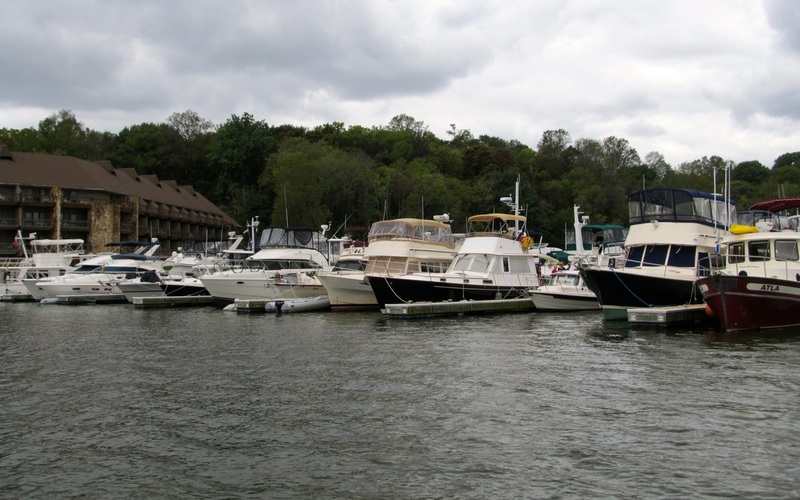 Though this marina is for leaseholders, Joe had arranged for transient moorage for us and the marina management was very cooperative. Heading out of Green Turtle Bay, we were behind a sailboat as they navigated the narrow channel with shoals on each side. They cut a buoy and were out of the channel. We would have done the same if we were not thinking for ourselves and simply followed them. Kentucky Lake has a host of interesting and safe coves and harbors to explore and anchor. They have interesting names like Duncan Harbor, Sugar Bay and Ledbetter Creek. Continuing southward across this narrow part of Kentucky, at one point, Kentucky was on the west side and Tennessee was on the east side of the lake. The boat traffic was light but constant and fell into three categories: tugs with barges, fisherman and cruisers. The cruisers were divided into two groups, “loopers” who are doing the great circle trip and “migrators” who are snowbirds heading to Florida for the winter. October is apparently the start time for the migrators to get their boats out of the approaching cold. Cypress Bay was on the west side of the lake and the state line bisected the bay. 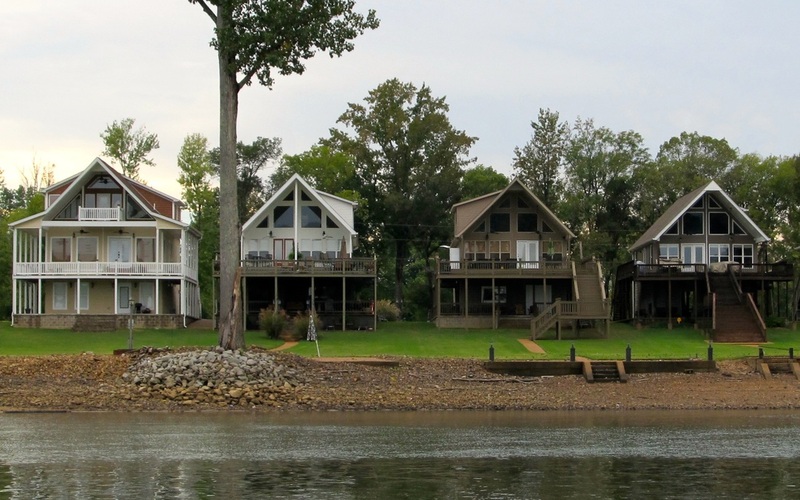 One part of the marina is in Kentucky and is “dry” or no alcohol is available and the other dock, where wee were, was in Tennessee and alcohol is available. Joe and Connie met us at the slip and we enjoyed drinks with them and their friend Bill who is a longtime resident of the area. Bill talked about the changes of the alcohol laws in Kentucky and described the state as “moist” where some areas are dry and others are wet. The day was closed Joe and Connie providing an amazing dinner of pork tenderloin, salad and vegies with storytelling and laughter under the stars that reflected off of the lake. The sound of the rain pelting the aluminum roof of the covered moorage was like a continuous drum roll on a snare drum. The thunderstorm came at sunrise and the downpour was hard enough to cause water droplets to bounce up from the lake’s surface and it stopped after 30 minutes to not rain again. This was the weather forecast for a 40% chance of thunderstorms. The morning remained cloudy with temperatures in the mid 70’s. After breakfast, we had coffee with Joe and Connie and then left the marina to head south on a flat lake with a light breeze. 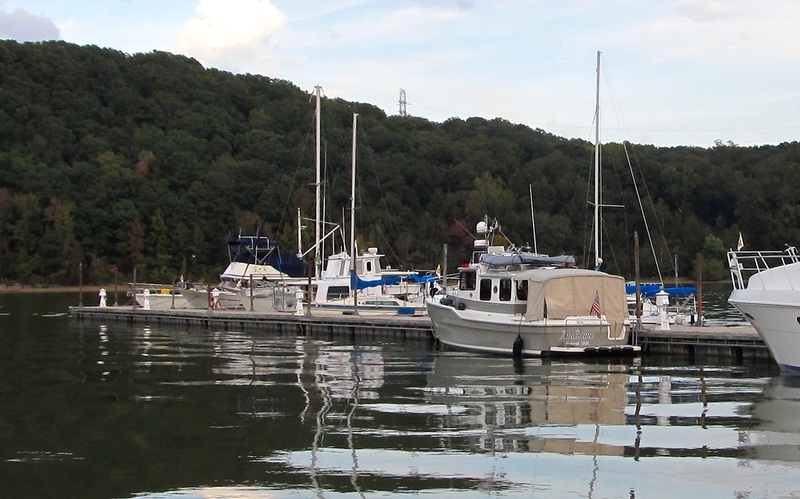 The destination was 35 miles away and the Pebble Isle Marina for fuel, pump-out and Tennessee prices of moorage. 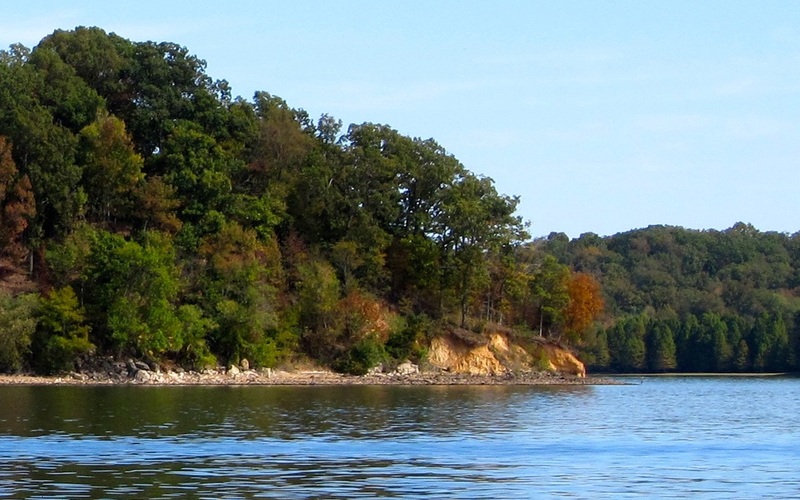 Kentucky Lake is over a ½ mile across and the channel moves from one side of the lake to the other. 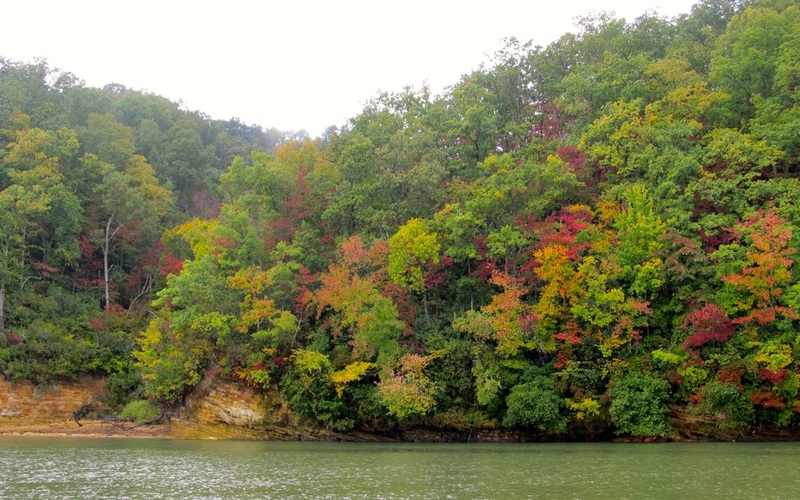 Often, there were exposed sand bars off the channel and the further south were small islets with a row or two of small, dwarf trees in the lake. 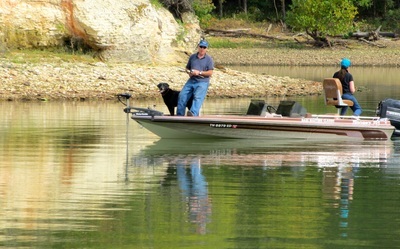 Though the boating was very easy as the channel was wide, the water was nearly flat and there were only the occasional go-fast bass boat and the southbound cruiser, a loss of focus could easily result in being outside of the channel. White pelicans were the constant companion, both in the air and flocks on the sandbars. 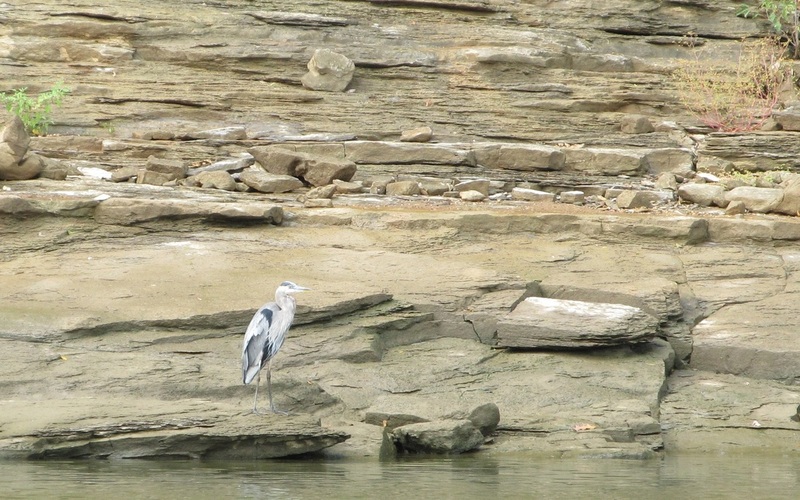 Laurie discovered that these pelicans spend the fall in the Tennessee and Mississippi River Valleys and spend the winter on the gulf coast. Different from the Brown Pelican in that they are very social in their groups, shy around people, and they scoop up their food rather than diving for it. Mid-afternoon and we arrived at Pebble Isle as the lake was as flat as a mirror and the humid air was dead still. Andiamo had traveled 374 miles since Alton, Illinois, getting 4.3 MPG and using 1.84 GPH. We walked the ½ mile to the Johnsonville State Park and the site of civil war battle that was notable because the Confederate Calvary defeated the Union Navy by using innovative tactics. 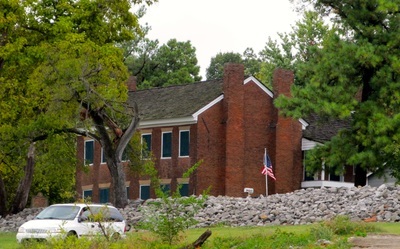 The take-a-way was the number of former slaves who were “impressed” into the Union Army and were assigned to defend the supply depot at Johnsonville. Many of them were killed in the trenches and were likely buried in a mass grave without any record of who they were. Returning to the tug, three more boats arrived and two of them were loopers. 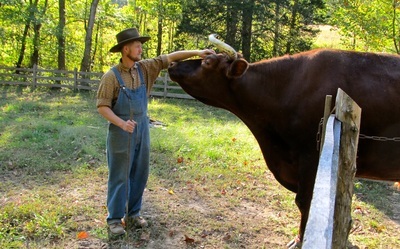 We had a great conversation with Forest who spends his summers in Tennessee and the winters in Florida. 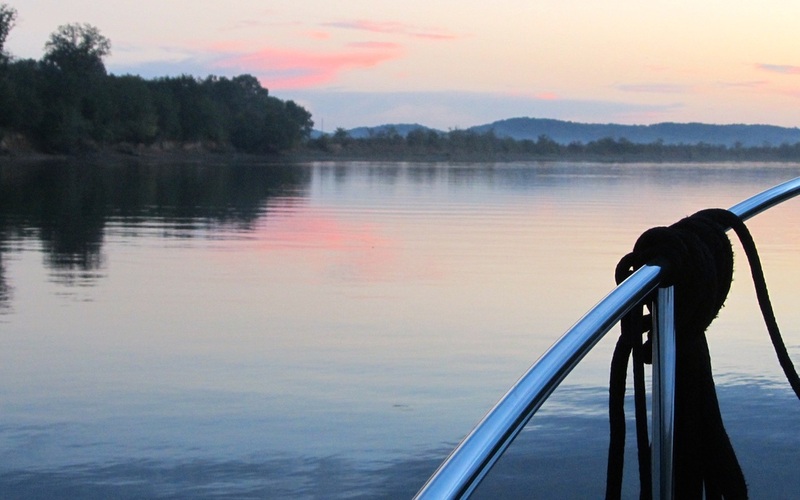 He has done the trip every fall and spring since 2000, piloting his 36-foot Willard single-handed and anchoring much of the way. 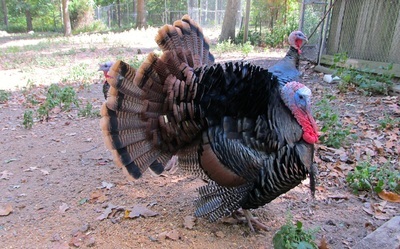 He shared information about the areas that we may go to and we enjoyed his company. 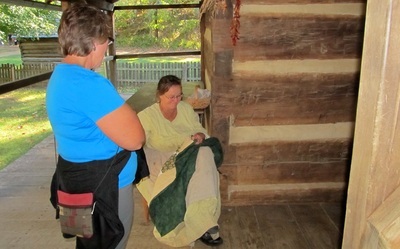 We met a “gold” looper who had completed the loop a year ago and did the 6,000 trip in six months, leaving Indiana in April and arriving back in September. Listening to their words, they had a schedule and a spreadsheet and were proud to have done it in six months. There is no bad way to do the loop; only your own way and though someone else’s version may not work for you, it worked for them. They are taking their trawler to Lake Okeechobee to be stored and intend to be there in 38 days. That made us think of what is possible as we discussed the next part of this adventure. The heavy rain woke Laurie up during the night and she closed the windows before any significant water came in. Unlike Seattle, rain does not mean cold and finding ventilation for the high 60 degree temperature can be a challenge. I think about switching out one of the windows under the canvas in the cockpit for a sliding one. Laundry was started while breakfast was being prepared. The marina staff prepares fresh cinnamon rolls each morning and two were picked up and delivered for breakfast. With the water tank topped off, the tug was re-set for the next part of this adventure. Though we had considered staying at the marina for another night, the weather forecast was 5 days of rain and the forecast for 100 miles south was better. 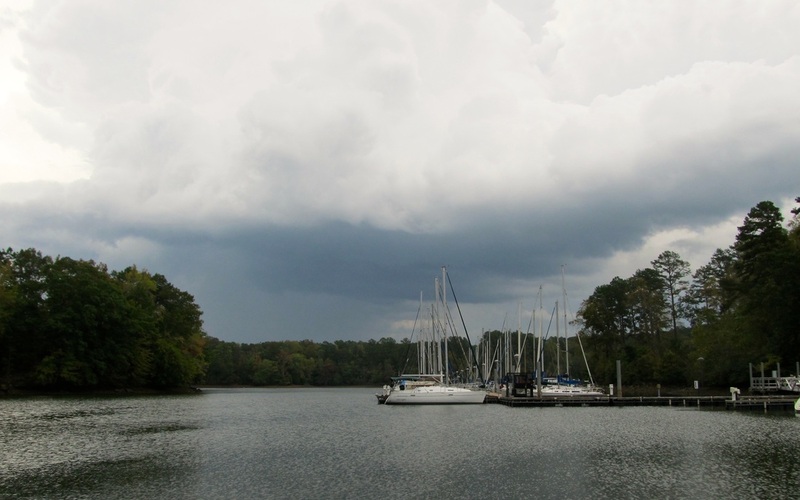 We opted for a couple of days of cruising in the rain and get better weather. Andiamo is well suited for cruising in the rain; we do it all the time on Puget Sound. Rain in the form of drizzle to full-on downpours would be the constant companion, but the air was still and therefore the water was nearly dead flat. Cruising in the rain can be safe with the right tools. The front windows and received two coats of Rain-Ex at Green Turtle Bay, a task that is done about once a month. This coating on the windows causes the water to sheet off more effectively than using the wipers. Andiamo’s radar showed when the thickest rain cells were approaching and provided assistance when the rain and the clouds made the visibility of less than a mile. The rain cells came on fast and were gone in minutes. 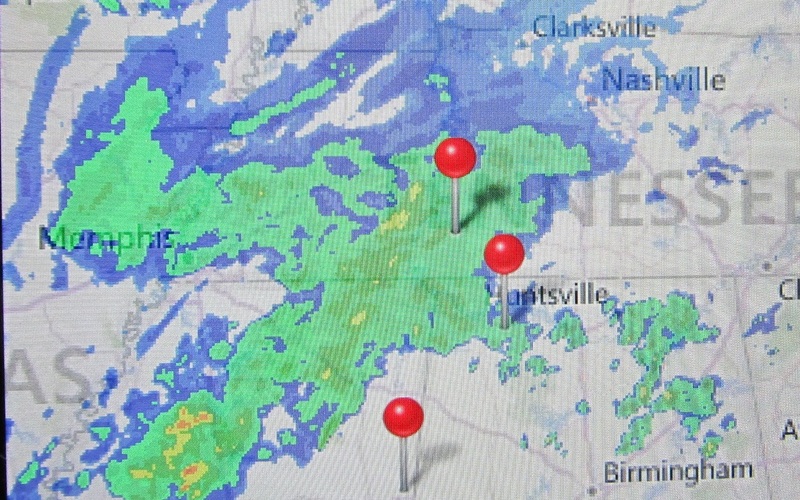 We watched the Doppler radar on Weatherbug to be prepared for the higher intensity rain and received the National Weather Service’s alert for a flash flood watch for this region. To keep the windows defrosted, the windows on the lee side of the rain are opened, a 12-volt fan that was added for Laurie’s cooling on the navigator’s side is tilted to the windshield, and the overhead defroster units can be used. 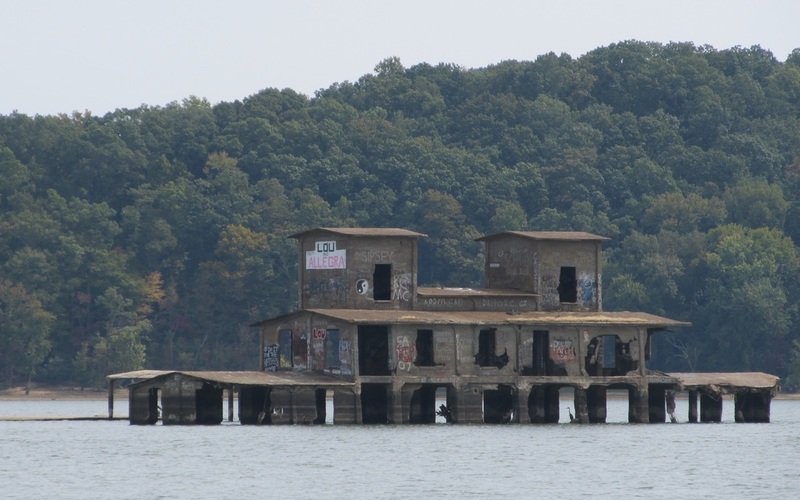 As we left the town of New Johnsonville, Tennessee, the industrial complex dominated the river. This DuPont plant was the central employer and the likely cause of the great sunset that was seen from the marina. Little towns will trade their environmental values for jobs and tax revenue. They may have the intentions but they do not have the staff resources to implement and monitor for compliance the giants of the potential polluters. 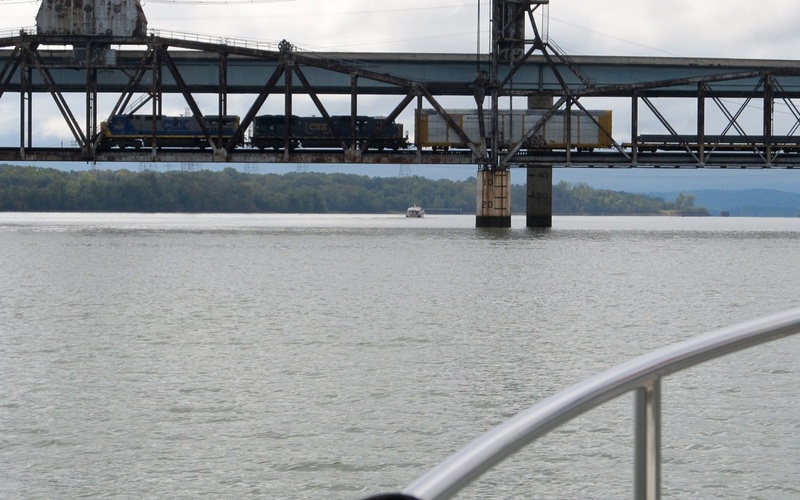 After going under the Interstate 40 Bridge, the official Kentucky Lake ended. 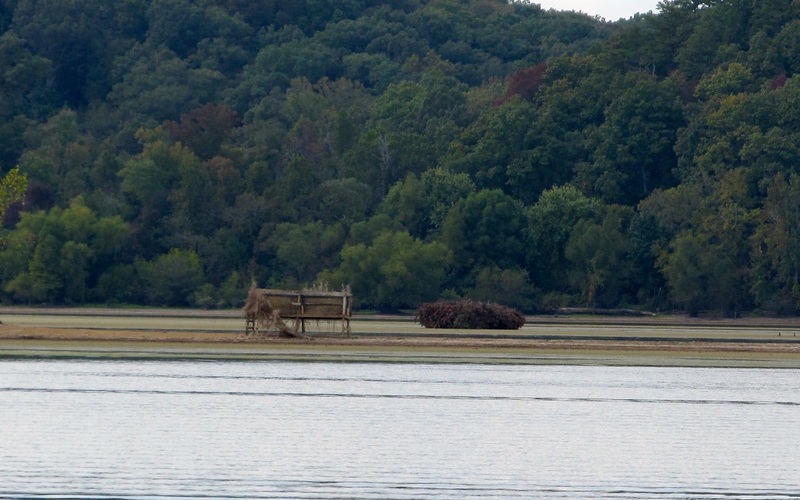 The Tennessee River started to exert its own personality from here southward. 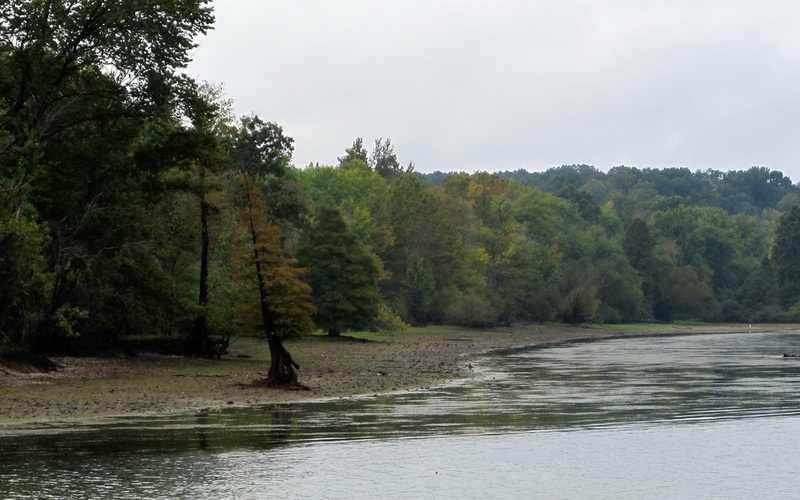 The river became narrower to about 1000 feet in width but it also got deeper from the 24 or so at Kentucky Lake to 40 and 50 feet deep. The whole river was the main channel, except when passing through the huge national wildlife refuges, and the buoys kept us in the main channel. There is light but steady current of perhaps 1 knot and that will explain our drop in speed from 7.8 knots to 7.3 knots. The topography began to change also to higher bluffs of limestone, many with houses perched on them. 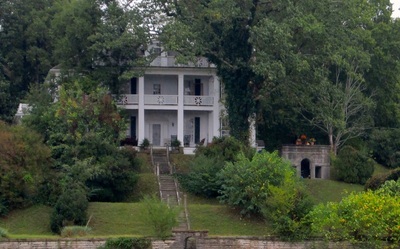 Around Ricket’s Creek, the river narrows to its more historical width and Andiamo had traveled about halfway through the state, being between Kentucky and Alabama. Near highways there are often rows of homes on one shore and RV parks on the opposite shore. Late in the afternoon, Andiamo anchored behind Double Island at Mile Marker 149 having traveled 53 miles in 8 hours. The next morning started as the previous day had ended with total cloud cover, cool, and still air. The only difference was the light drizzle. The drizzle, showers and rain would continue throughout the whole day. 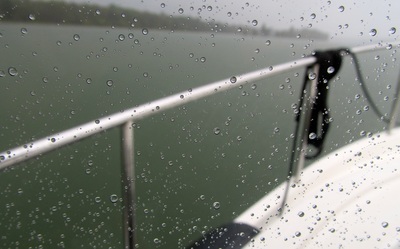 It was another day of cruising in the rain, but it was still delightful because the weather did not dampen the adventure or the comfort of cruising on Andiamo. Leaving Double Island the way we entered and continuing upstream or “up bound” on the Tennessee, this part of the river would be the most curvy as two oxbows were back to back. Two miles of travel by a straight road would need 9 river miles. 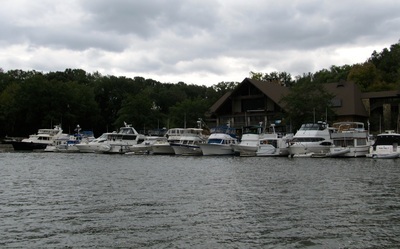 Soon, Andiamo was going past Clifton, a town of 2,000 that has one of the few marinas that are within the city limits. Clifton was also nearly selected as the state’s capital when such things were decided. 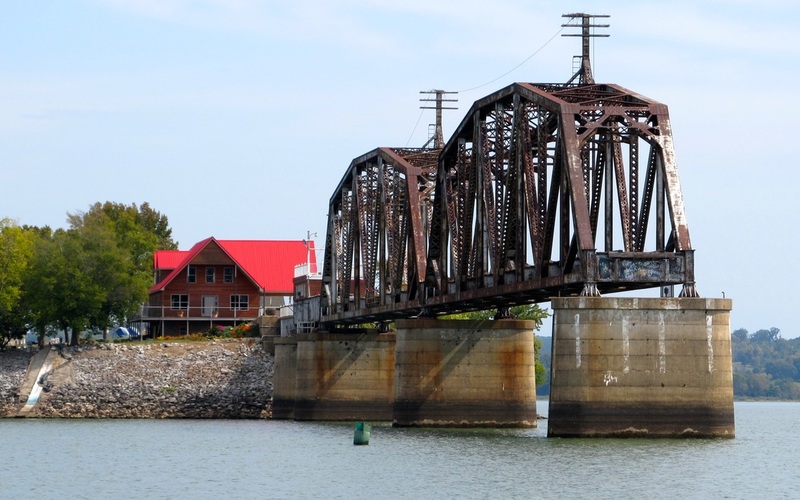 The Tennessee River would show more of its character over the 58 miles of travel. With the downstream dam over 150 miles away, the river was more of its historical self with the width being about a ¼ mile across, the depths were generally in the mid-20’s and the current would intensify the closer the tug got to Pickwick Dam. What started as a 1 MPH current, became 2 MPH, and 10 miles from Pickwick Dam, the current became a strong 4 MPH. Except for the towns of Clifton and Savannah, the river goes through rural Tennessee that is mainly tree-covered banks, banks of limestone, and only a smattering of houses. 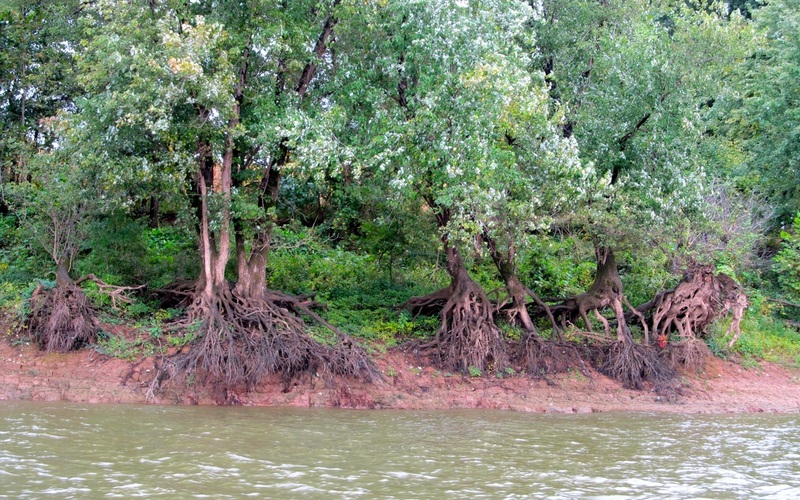 These structures were generally on stilts or constructed on one or two story block foundations, a testament of the power of the river that runs over its banks and takes out everything in its path. 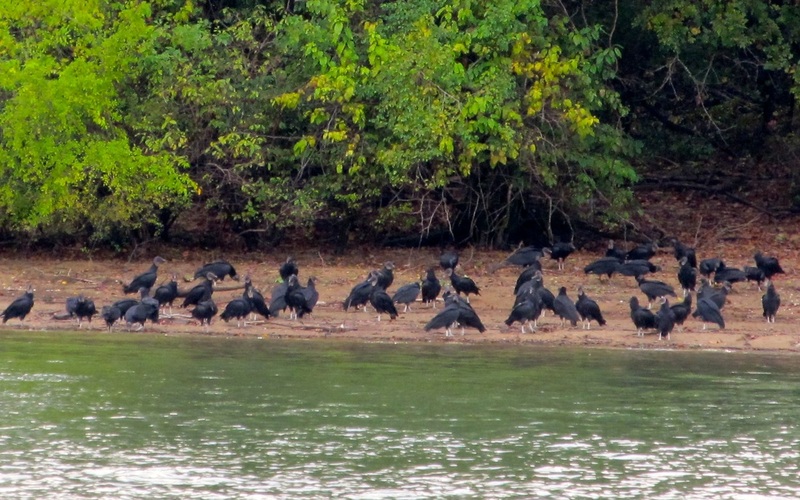 The whole day, on this Saturday, less than a dozen people were seen on shore. More eagles were seen. 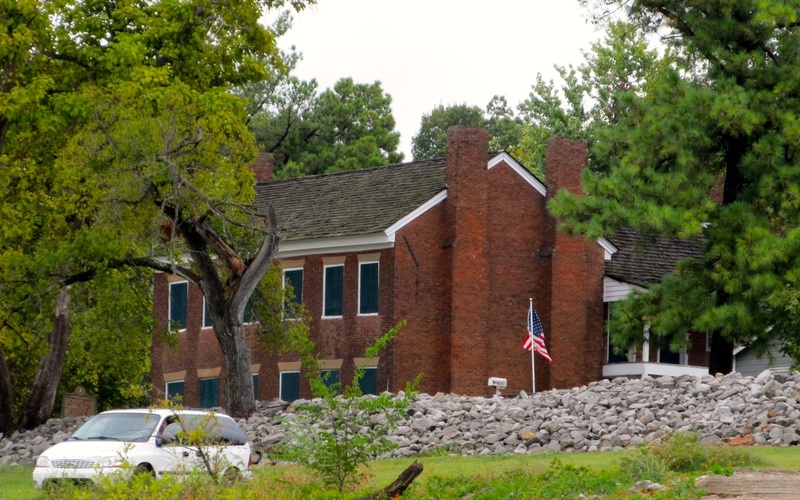 Passing Shiloh National Military Park, the story was remembered from our previous trip. 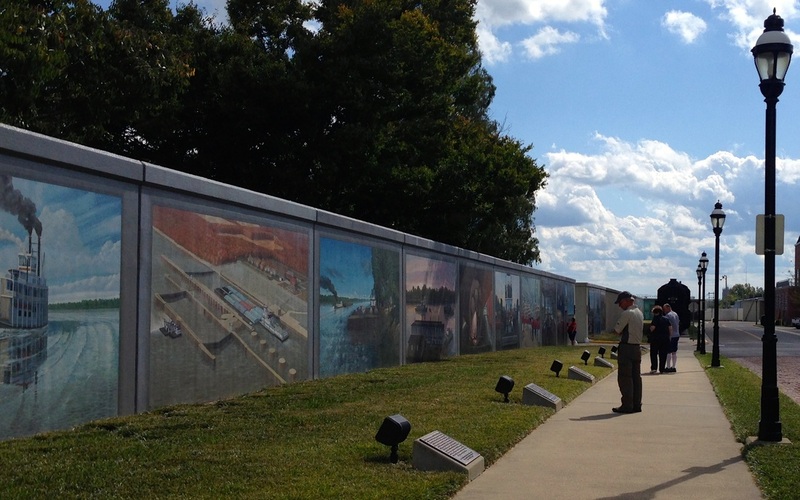 A place where, regardless of which side or cause, heroism, defeat and surrender occurred. It was hallowed ground when nearly 80,000 soldiers engaged in combat and struggled with their own physical and emotional demons and 23,000 were killed, wounded or missing. We found it easy to understand why new military officers come here to study. It is more than just learning tactics and strategy. The real learning is probably more about how to lead thousands of new soldiers, untested in battle, to not only survive but to succeed. 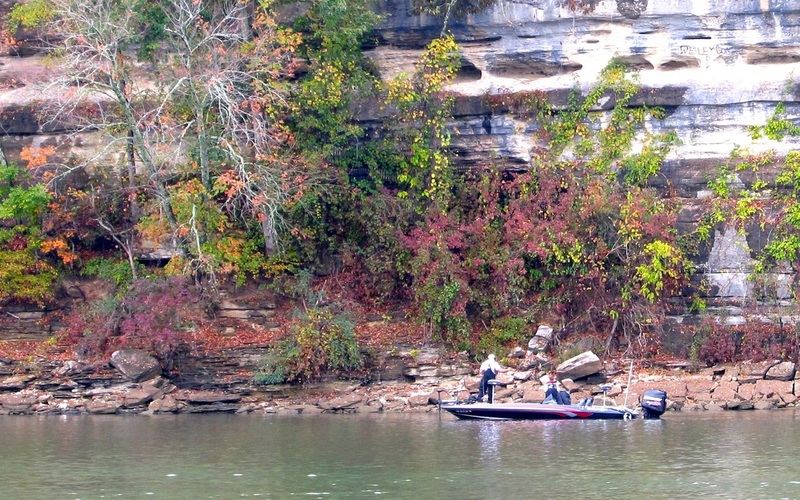 Ten miles before Pickwick Dam, the current had slowed Andiamo’s speed from 7.4 to 5.8 MPH. We used that tool or option that Andiamo has, to drop the throttle to the tug’s fast cruising speed and we were going 11 MPH. Closer, to the dam, that dropped to 9.8 MPH and more throttle was given. This current was not for the slow cruisers. Four other pleasure boats were waiting at the closed doors of the lock. Call it serendipity or just good timing, as Andiamo approached, the doors of the main chamber opened and we went right in for the nearly 60-foot lift. 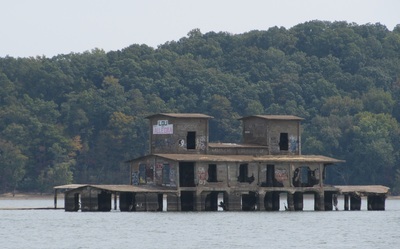 Immediately, after the dam is Tennessee’s Pickwick State Park and Marina and we took an empty slip among many. Andiamo had traveled 58 miles in 8 hours. The sun was down shortly thereafter and the day was closed with taco salad and fresh beer bread that Laurie baked while underway. 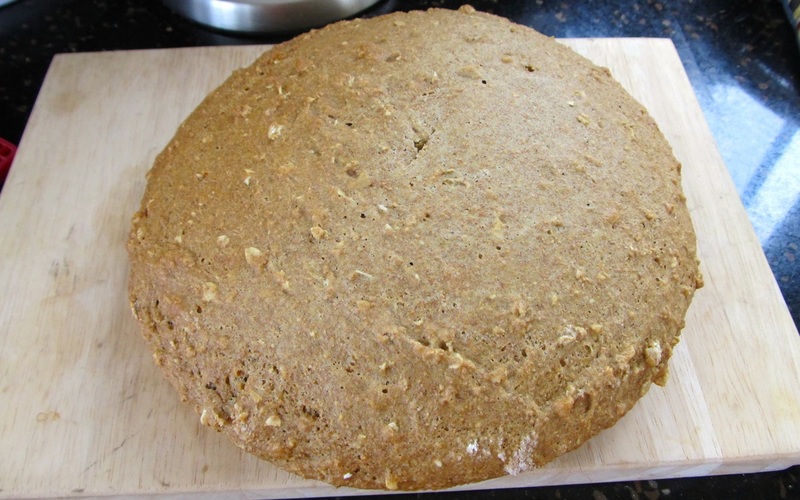 Sunday morning was cool with a light breeze from the south that brought rain showers off and throughout the morning. After a 45-minute walk around the park, we started on boat projects. 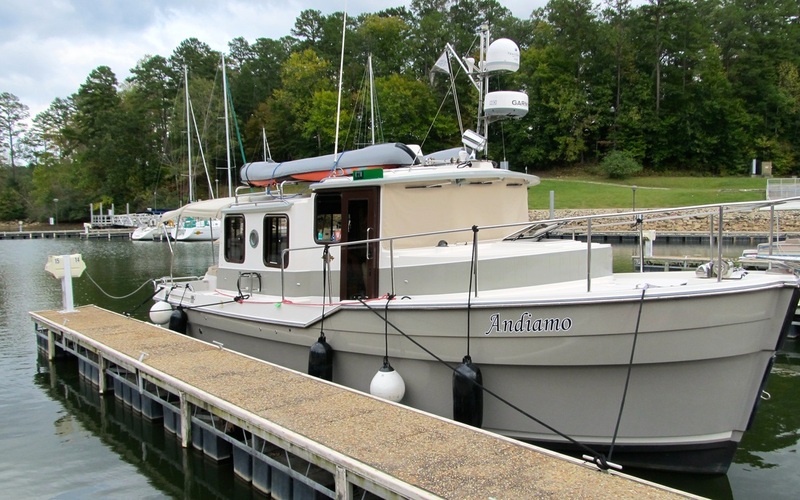 Andiamo had nearly 1,000 hours on its engine and it was time for an oil change and fuel filter change. All the parts and fluids were on hand and using the procedure that was created in Jacksonville, Florida and improved in Peterborough, Ontario; the whole job was finished by lunch. 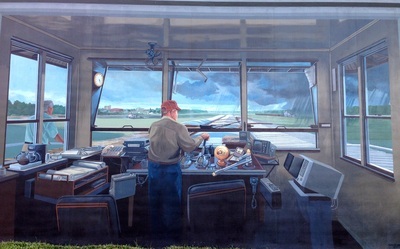 The cockpit canvas on the port side provided shelter from the rain. 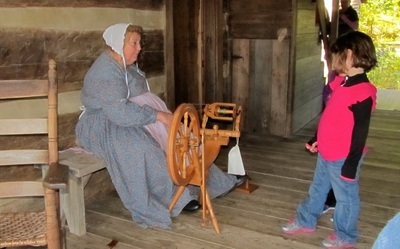 Laundry was done, we met Bob and Kami who are migrators from Wisconsin and heading to Key West on their sailboat, and the afternoon was closed with another walk. Joe and Connie from Chesapeake had given us their DVD with four episodes of Jesse Stone starring Tom Selleck and we were addicted. We would stream more episodes on Netflix. The next morning the weather forecast was for a severe weather cold front coming through bringing gusting winds, thunderstorms and a tornado watch. We opted to stay another day and did the cleaning and maintenance that is occasionally required. Laurie made a soup and another episode of Jesse Stone was streamed. While cycling through the park, a ranger told us that severe weather including a tornado watch was coming. He said the park does not have any warning sirens and if needed, to get to the lodge as they have a basement. The clouds and the breeze intensified through the afternoon and the progress of the cold front was monitored on Weatherbug. Extra lines and fenders were put out and Andiamo was spider-webbed into the slip. By 4:30 PM, the day was unusually dark and the weather service was sending alerts for a severe thunderstorm with hail and 65 MPH gusts. Lightning and thunder surrounded Andiamo for much of the night. The bulk of the cold front blew through by morning leaving low clouds, cool air, and a fresh breeze from the west. Being on a boat and doing the Great Loop makes the weather center stage and it is not an abstract notion that is adequately covered in 5 minutes on the evening news. 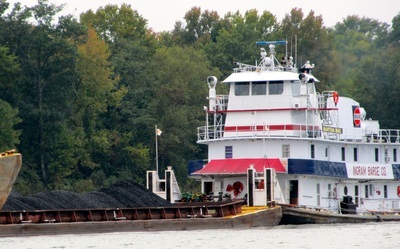 Several miles after leaving Pickwick Marina, Andiamo passed the turn to the Tennessee-Tombigbee Waterway and entered Alabama. The tug hugged the south shore of Pickwick Lake for some protection from the wind but more importantly, the water was calmer than the center and northern portions where the wind had created a chop. 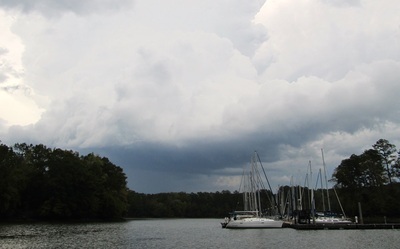 Rain cells came and passed over Andiamo as the tug headed up the Tennessee River for a two-day trip to Joe Wheeler State Park. 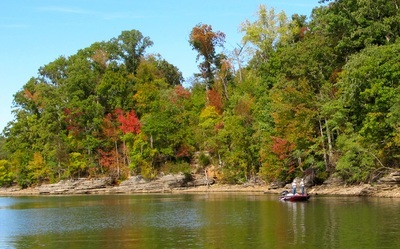 Pickwick Lake is about a mile across and the lower portion is nearly void of any current, the depths in feet are in the mid-20’s, and the forested shoreline and hills are thick with oak, willow, sweet gum, maple and pine trees. 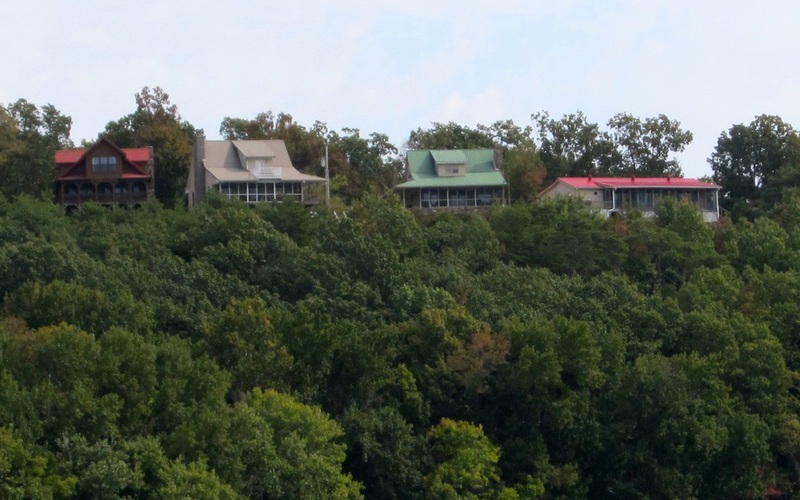 There are no houses because the Tennessee Valley Authority, the quasi-governmental agency that built the dams and later the power generating plants, owns the property. Where there are no roads, there are no homes. The destination was Florence, Alabama and the marina that is just before the Wilson Lock and Dam. About 2/3 of the way, the current from the dam was felt starting at the Natchez-Trace Parkway Bridge and the current would steadily build to about 2 knots when Andiamo reached the Florence Marina. We arrived at the marina about 3:30 PM and it was nearly empty. The enthusiastic harbormaster met the tug at the long transient dock, gave us the introduction to the area and how to use the free courtesy van. Laurie decided to do a provisioning trip so we drove to the Publix Market where the selections were refreshingly wide for all items. Afterwards, we had an early dinner at an Applebee’s. The evening was closed with another Jesse Stone movie as the wind and the brief rain cells blew over the tug. The tug had gone 48 miles in 7 hours. The next day, the morning was cool, cloudy and breezy and the wind would rise later in the day and be a factor for the whole day. 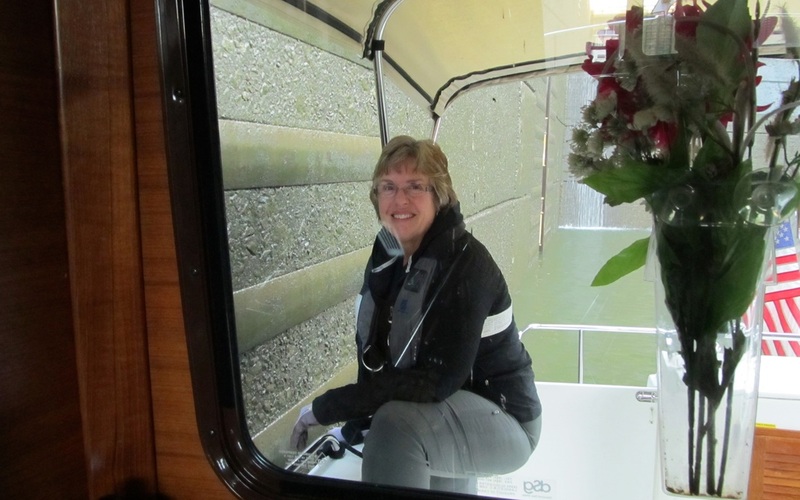 Laurie called the lockmaster at the Wilson Lock and Dam even though the AIS showed no tugs at the lock or nearby. 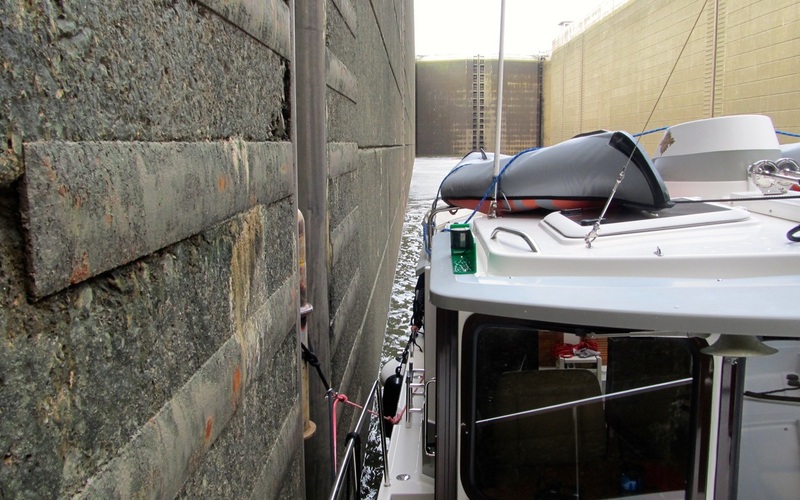 The very polite employee said to, “come on up and the lock doors will be open for you.” Casting off the lines and proceeding up the side canal that goes around the dam, the lock door were still closed. 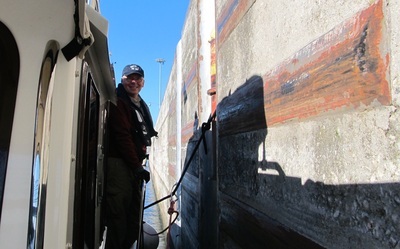 The lockmaster was apologetic on the radio saying that lock was not quite ready, so Andiamo was tied to the lock wall and we waited about 20 minutes. 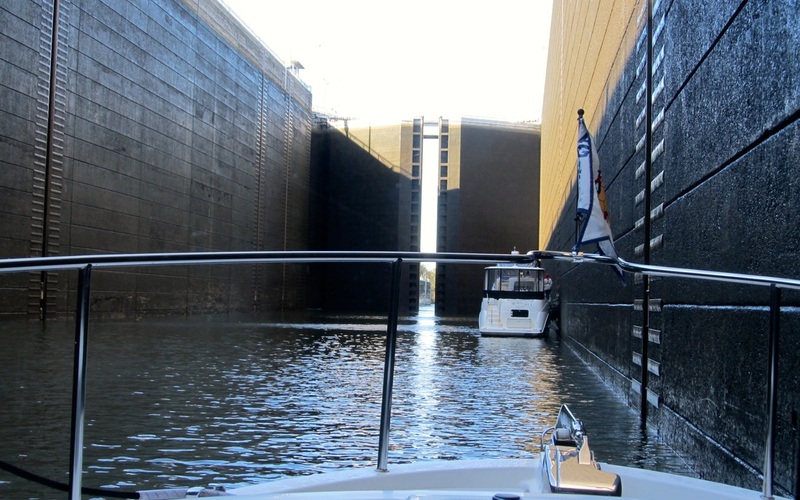 Wilson Lock has one of the highest lifts at over 90 feet or nearly 10 stories. 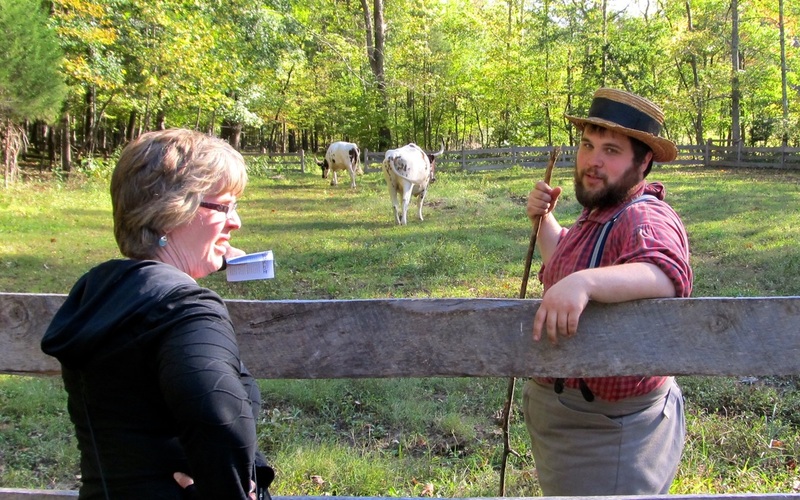 The lockmaster was waiting on the rail as Andiamo was lifted to him and he genuinely apologized for the short wait. 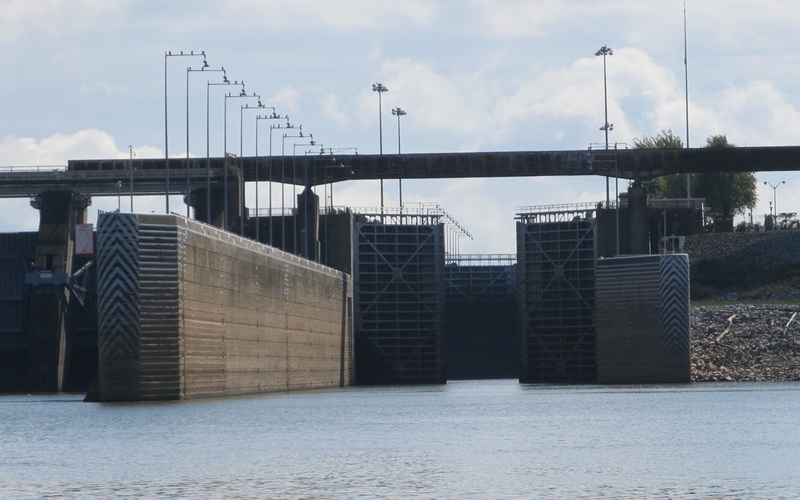 We are surprised only because we had waited hours at several locks and never, ever heard from an employee. Andiamo was the first boat through the lock. 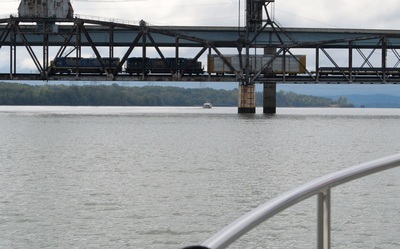 The lockmaster spoke about boaters who can be a problem, ones that have been drinking, ones that do not follow instructions and ones that demand preferential treatment because of the size or value of their boat or because they say they are special. We feel that locking through is a privilege and not a right. 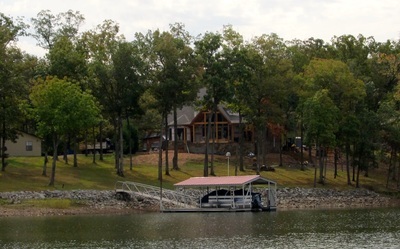 After the lock is Wilson Lake, that is deep and has a number of houses on both shores. 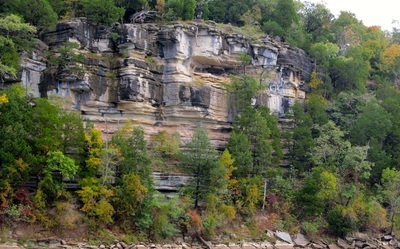 The westerly wind and climbed to the mid teens in speed, causing white caps and a 1 to 2 foot chop that Andiamo was surfing to the Wheeler Dam that was 15 miles away. 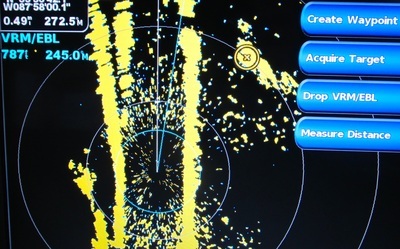 The AIS on the tug’s chartplotter showed two commercial vessels at the lock but we hoped to use the auxiliary lock and get through. Those dreams evaporated when the lockmaster said there was at least a three-hour wait as a doublewide barge was locking through the main lock. Outside the lock were two Army Corps of Engineers tugs and a work barge. As we were studying the places to wait and have protection from the wind and the chop, the lockmaster radioed that one of the Corps of Engineer’s tugs was going to lock through and Andiamo may be able to go through with them. Maybe the timing was just right, maybe the lockmaster at the Wilson Lock had spoken to this lockmaster, or maybe Laurie’s polite words and tone made a good impression. Regardless, the tug gave permission for Andiamo to lock through with them and in short order we were in the lock. Then, the real fun began. 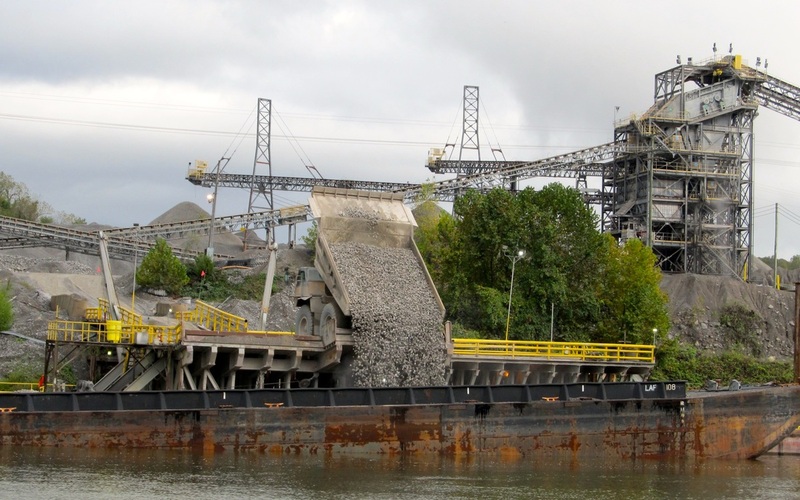 The westerly wind had raised another notch and was pushing the tug hard into the lock. Just as the tug was slowed down at the bollard and Laurie got a line around it, the wind blew the tug’s stern away from the lock way and quickly Andiamo was sideways in the lock. The bow and stern thrusters was no match for the wind. 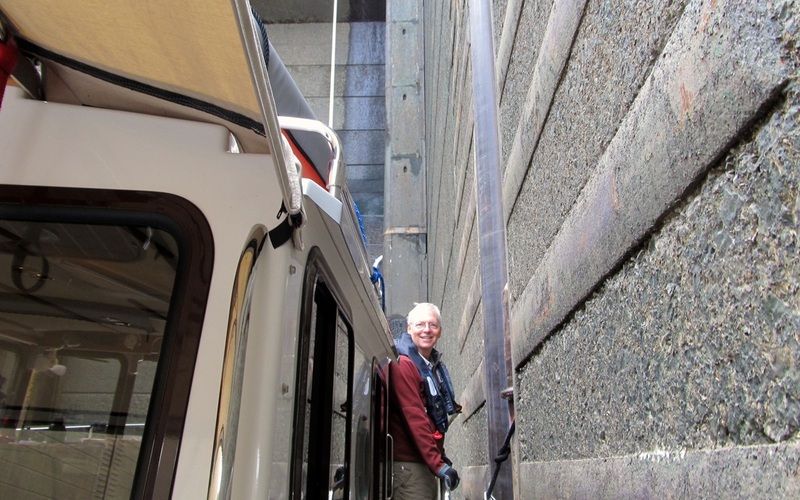 The Ultra Anchor on the bow was on the only thing between the rough and rusty lock wall and the tug’s smooth gelcoat. The grinding of the stainless steel against the concrete was heart breaking. Eventually, the wind paused and a combination of using forward and reverse with the appropriate steering brought the tug’s side to the wall and the tug was secured. Though it felt like 10 minutes had elapsed, the whole episode lasted probably two minutes. Later, a close inspection showed there was no damage to the anchor or the tug. Joe Wheeler State Park is two miles from the Wheeler Lock and Dam. Andiamo arrived at the marina and to the spring rendezvous of the American Great Loop Cruisers Association at 12:30 PM having traveled 21 miles in 4 hours. The harbormaster told us there were about 55 boats attending the rendezvous. 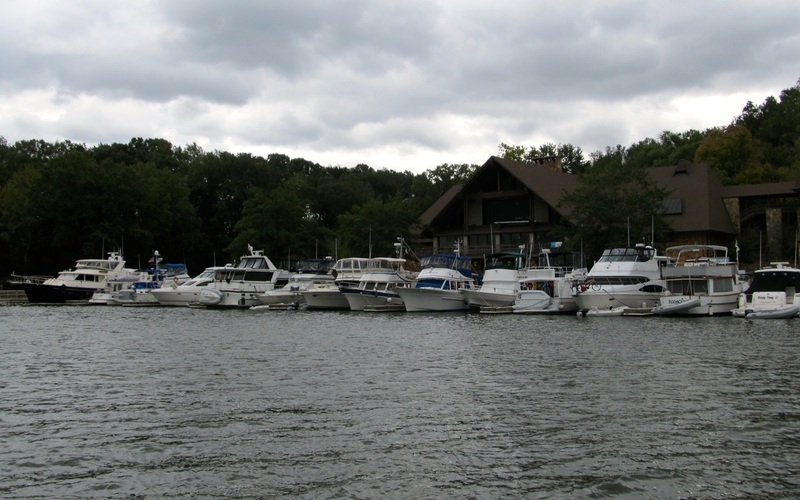 We walked the docks and recognized one boat that we had seen at Peterborough, Ontario. After catching up with them, the afternoon was spent at Andiamo meeting several loopers who came to us after being attracted to the tug. The day was closed with a good conversation with Jim and Lisa Favors whom we had first met at this place six years before when we had the Laurie Ann. The day was clear with a bright blue sky and temperatures in the low 70’s. We walked the one-mile loop trail that goes through the woods and saw a doe and her very young fawn with that non-verbal message that said, “We know that this is park and we are safe.” This was a day of reunions and more conversations with loopers. Paul and Stacy arrived and we had a reunion after several years. They had places to go and people to meet at the rendezvous. The shower sump pump was the project of the day with a thorough cleaning and an assessment of why it worked only intermittently. A replacement pump and float switch will be acquired and installed. Evan and Pookie are loopers and tug owners that we also met six years ago and they took us out to lunch in Rogersville. Afterwards, they showed us their Ranger 25. 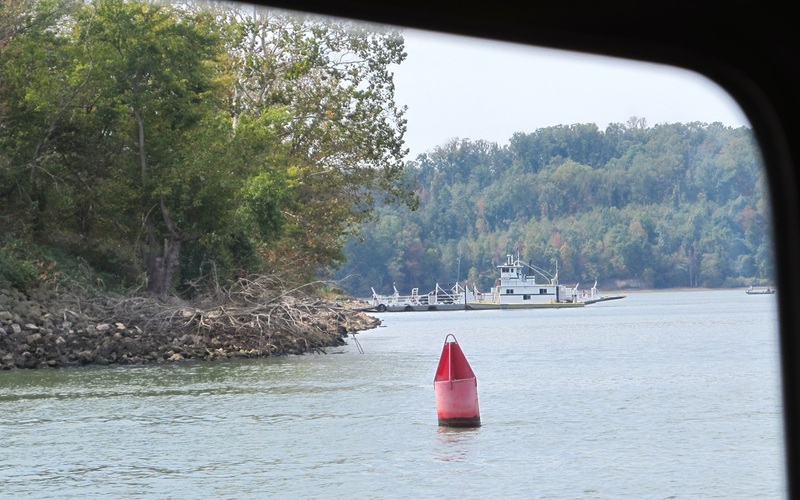 The afternoon was preparing Andiamo for the trip back down the Tennessee River to the Tenn-Tom Waterway by getting diesel, pumping-out and re-setting the tug. More conversations with loopers and want-a-be loopers about the tug and the trip were held on the dock. Tomorrow, Paul and Stacy and delivering a looper yacht to the Grand Harbor Marina as the owner is in the hospital. 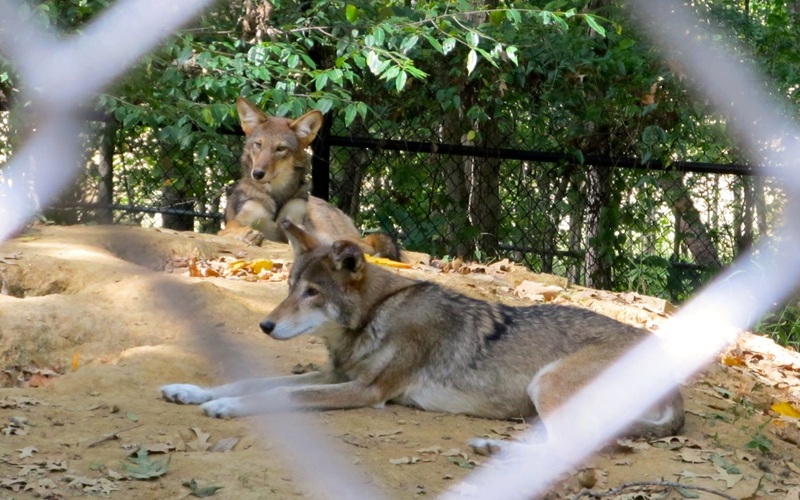 We will follow them and then spend the weekend together. The evening was closed with a light dinner and watching Scandal on the laptop and the TV. 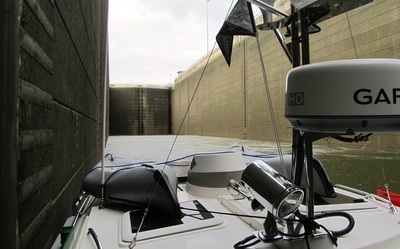 With the rendezvous over, a lot of loopers were likely leaving this morning and they would be trying to get through the Wheeler and Wilson Locks in mass. Paul and Stacy hatched the plan to contact the Wheeler Lock at sunrise to see if we could the jump on the crowd of looper boats. Andiamo was started before sunrise and had slipped its lines when the lockmaster said to come on down. 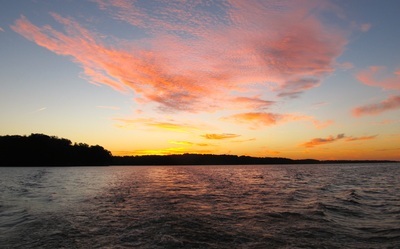 A tow was just coming out and we were able to go right in under a beautiful sunrise and flat water. The Wilson Lock was a repeat, as the lockmasters were getting ready for the crowd of looper boats. Continuing past Florence with the 3 MPH current pushing us to westward, the fresh westerly breeze was causing a one-foot high chop. Paul and Stacy pulled ahead of us and we could catch up to them at Grand Harbor. Andiamo arrived in the mid-afternoon having traveled 62 miles in 9 hours. We met Jim and Margaret who are doing the loop in one-month increments in 27 foot Albin cruiser that is stored on land the other 11 months. They are from the Olympia, Washington area and we were excited to meet them. Stacy and Paul drove us to a BBQ restaurant for a great meal of ribs. The next day, Stacy and Paul had moved aboard Andiamo before breakfast and we left the marina in the mid-morning to explore the area and find an anchorage. 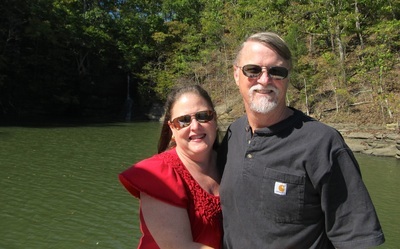 They drove Andiamo; we explored “the waterfall” and we anchored in Whetstone Branch of Pickwick Lake in 12 feet of water in the early afternoon after cruising for 13 miles. The fresh northerly breeze blew over us with a light wind keeping everyone cool. Into the evening, we talked about many topics and told a host of stories. 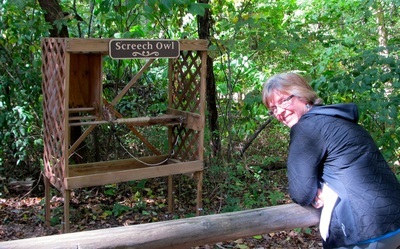 At Johnsville State Park, there was no information about these. 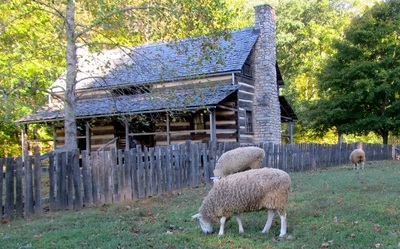 Slave quarters? A brothell? Popcorn sales? Be prepared to spend the night? 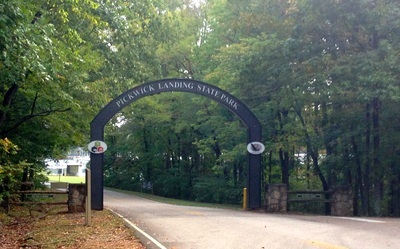 An entrance sign to remember. After weeks of dealing with tows, seeing one on land was just out-of-place. What is the story? The business owner should be happy, it is a head turner and separates it from the competition. 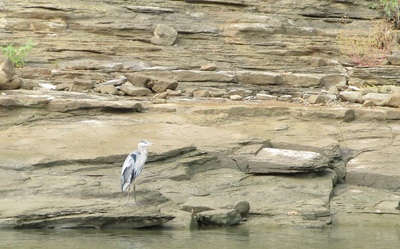 Man adapting to the river. After repeated flooding, the persistent owner builds two stories of flood protection for one story of occasional living. 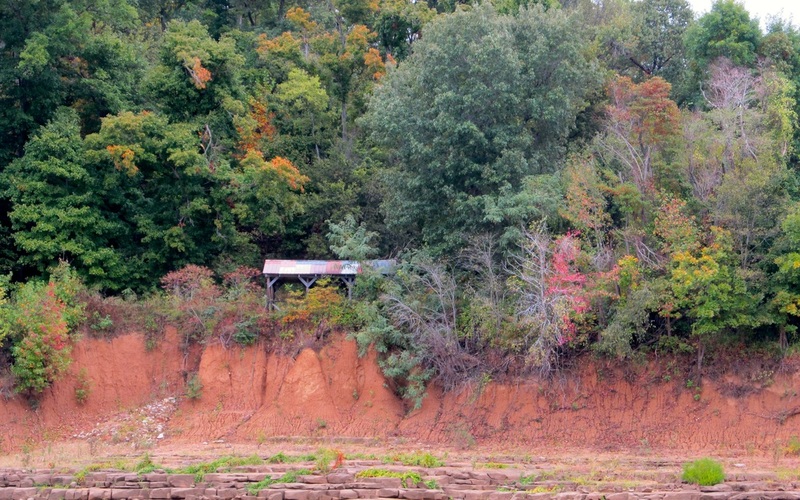 Like the above photo of man trying to defeat nature, this one has a boat tram on rails. Maybe it is the real-lfe bat cave? All that is missing is the rotating yellow cautionary lights to warn the oncoming traffic of vessel ejecting when the roll-up doors open. The human story in one photo, of the old and the new. 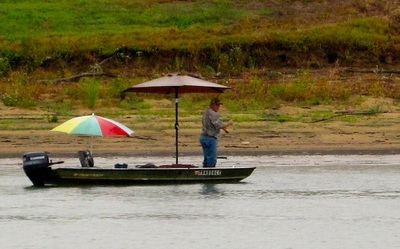 Just downstream of Pickwick Dam was this secured raft of instruments. Hope that they are rugged. Is Tennessee leading the boating world? 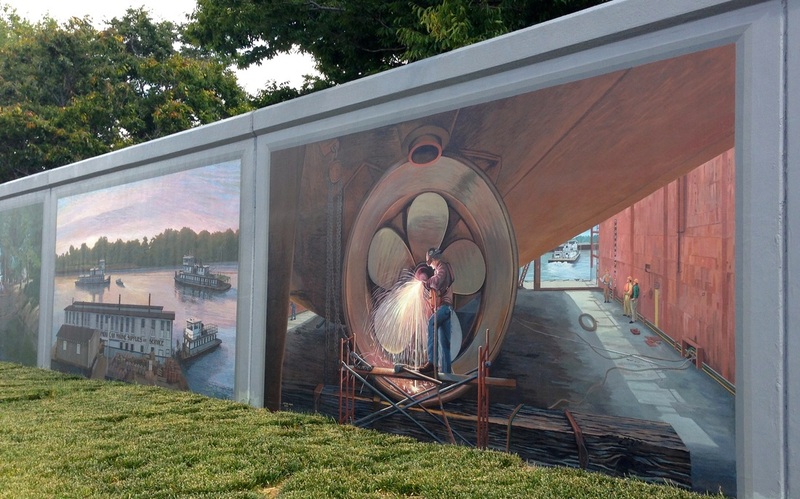 Has the electric boat made its debut? Given the number of charging stations in this hotel parking lot, this must be a major trend.